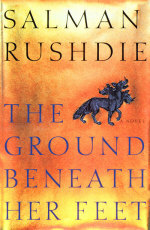 “In autumn 1999, I published my novel The Ground Beneath Her Feet, in which the Orpheus myth winds through a story set in the world of rock music. Orpheus is the defining myth for both singers and writers – for the Greeks, he was the greatest singer as well as the greatest poet – and it was my Orphic tale that finally made possible the collaboration we’d been kicking around. It happened, like many good things, without being planned. I sent Bono and U2’s manager, Paul McGuinness, prepublication copies of the novel, in typescript, hoping that they would tell me if the thing worked or not. Bono said afterwards that he had been worried on my behalf, believing that I had taken on an impossible task, and that he began reading the book in the spirit of a “policeman” – that is, to save me from my mistakes. Fortunately, the novel passed the test. Deep inside it is the lyric of what Bono called the novel’s “title track,” a sad elegy written by the main male character about the woman he loved, who has been swallowed up in an earthquake: a contemporary Orpheus’s lament for his lost Eurydice.